Trails End began as a bold slab-serif font. To that, I’ve added a rough edge and grainy texture producing a unique rustic style. 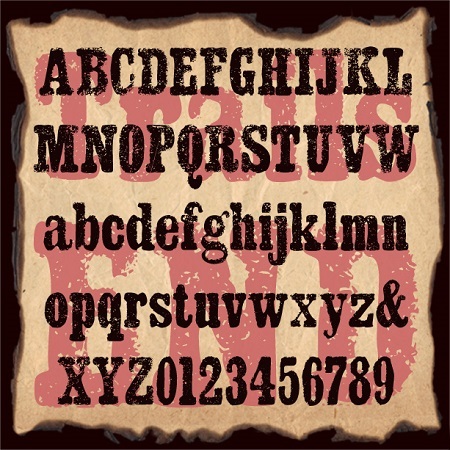 Trails End suggests crude letterpress printing on rough paper, a weathered sign, or a well-worn T-shirt. 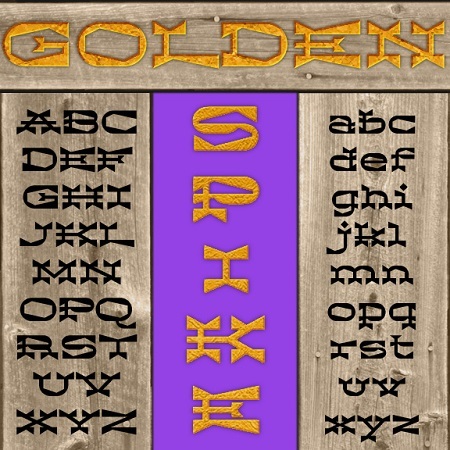 Golden Spike is a unique font that combines the bold serifs of a Western woodtype with dramatic wedge shapes for an exotic texture. Golden Spike was inspired by this tiny image of unknown origin, sent to me by Vista Bill. Also available in “Deep,” a three-dimensional version. 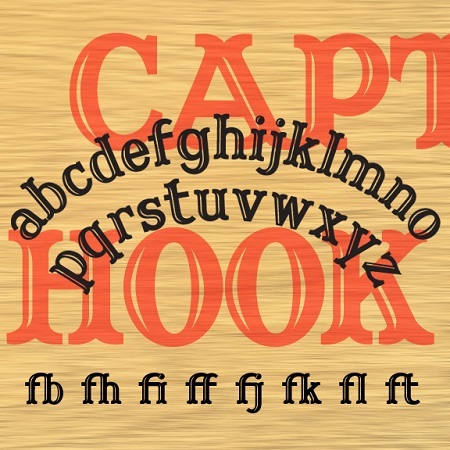 One of my popular early fonts is Captain Howdy, inspired by the lettering on a Ouija board, a rather jolly woodtype font with curved serifs and engraved highlights. Now there’s a whole new font, CAPTAIN HOOK, that marries the classic caps to an all-new lowercase. Because sometimes you just need lowercase. 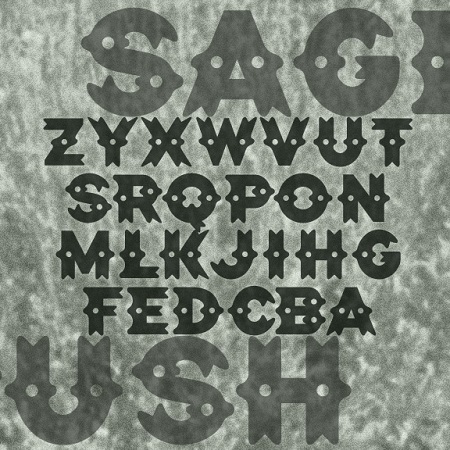 SAGEBRUSH is a decorative font with a Western flavor, its distinctive dots and curves and suggesting silver conchos, sheriffs’ badges, cowhides and spurs. In reality, it was inspired by the logo of the legendary NYC punk club CBGB OMFUG. When you learn that CBGB stood for “country, bluegrass, blues,” it’s easier to see what they were going for with this design, so far from punk typography. 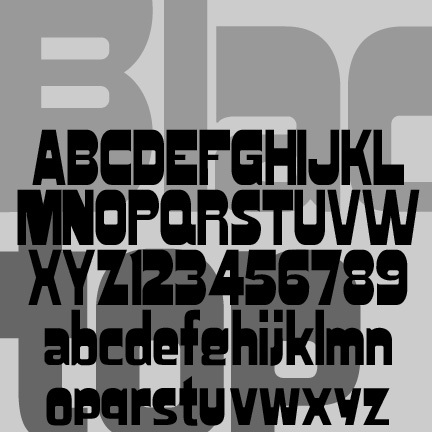 Blacktop has been tweaked, expanded and reissued in celebration of National Woodtype Day on March 15. 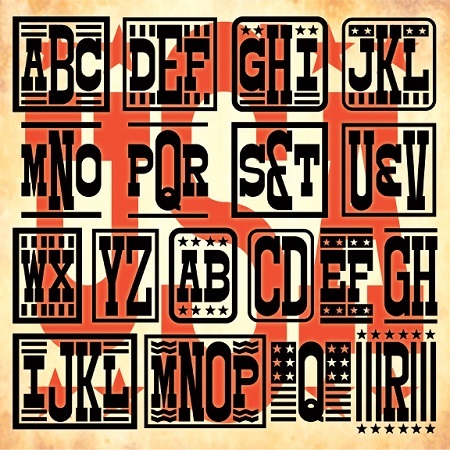 The uppercase and numbers were originally inspired by a woodtype font variously known as Gothic Bold, Jubilee, or Skidoo Caps, and completely redrawn for clean edges. The lowercase is my own invention, following the example of certain fonts (Hobo, Publicity Gothic, Broadway) in which the descenders do not go below the baseline. WESTERN AVENUE is a pair of fun fonts with triangular “latin” serifs and spurs. The bouncy irregularity befits their inspiration: the unsigned 1950s album cover at left. 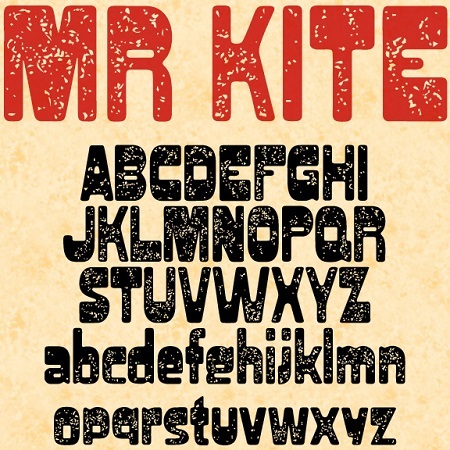 Includes upper and lowercase, numbers, punctuation and international characters. OpenType features include stylistic alternates and discretionary ligatures for a more random, hand-lettered feel. An earlier caps-only version in this style was called Western Egg.